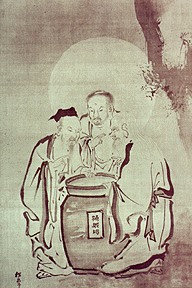 The painting shows three man tasting from a bin of vinegar. The expression on each man's face shows his individual reaction. Since the painting is allegorical, we are to understand that these are no ordinary vinegar tasters, but are instead representatives of the "Three Teachings" of China, and that the vinegar they are sampling represents the Essence of Life. 1) K'ung Fu-tse (mispronounced "Confucius") - considered life to be sour. He felt that the world was a disorderly place, which had to be controlled. 2) Buddha - considered life to be bitter. He saw the world as full of pain and illusion, full of attachments and traps. He felt that we must work spiritually to rise above these things. 3) Lao-tse - considered life to be perfect & wonderful as is. He saw a natural harmony that could be experienced by anyone at anytime. He believed the world to be a teacher of valuable lessons, and that we should embrace the wonder of every moment. Gepost door DA op 5:52 a.m.
What a wonderful place, thank you da. I have reacted to life by the three tastes of vinegar and at this moment recognize the value of all three,, yet lean to LaoTse's definitions more closely.